New Orleans Real estate associations of landlords, developers and the politicians they finance can scream about supply and demand and straight-laced economics, but as long as tenants are being squeezed by escalating rents and stagnant wages in the United States and around the world, the demand for rent controls will rise as quickly. Voters may once again have the opportunity to push such proposals forward soon, so the debate will move from landlord whining to the potential of tenants’ winning. According to a Harvard study, from 2000 to 2016, median inflation-adjusted rents in the US rose 15% to $980 per month while renter incomes declined to $37,300 from $38,000. That’s the big picture explanation and once you add gentrification pressure in city after city, neighborhood after neighborhood the pinch becomes even more pronounced for many families. Oregon narrowly defeated a statewide referendum last year. Activists and housing advocates in California and Washington state are moving to put propositions on the ballot in order to repeal state laws that restrict the ability of local governments to devise local mechanisms to deal with this surging crisis. Bills are before the Washington legislature to allow action on this issue as well. 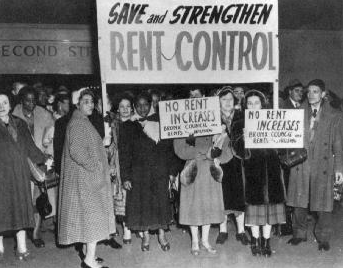 In Illinois, lawmakers have proposed legislation lifting the state’s 1997 ban on rent control. Some Chicago voters will be able to vote in March on a nonbinding ballot question regarding whether or not to lift the ban. Officials in city after city are being pushed into debates over housing affordability. The ACORN Home Savers Campaign has found that the crisis is also fueling the increase of predatory land contracts because lower income and working families are often choosing almost inhabitable housing as opposed to homelessness or unaffordable rents. In the United Kingdom where the issue is also pronounced, ACORN affiliate Living Rent in Scotland has won enactment by the Scottish Parliament of a unique provision now being implemented that can designate specific neighborhoods as rent imperiled and enact controls to provide relief. ACORN Bristol has won important protections from landlords in private rental arrangements that are largely surpassing those in social or public housing now throughout England. The surge in the cost of rental housing for students has triggered organizing drives for new ACORN affiliates in Brighton and Manchester in England. The fight won’t be easy anywhere. The New York City Rent Stabilization board voted to approve a 1% rent increase after two years of freezes, though no one is pretending that rents aren’t soaring in the city. A woman in Boston attending a class at Boston University where I was speaking about organizing and the Nuts & Bolts of what it takes to win change, said at the end of the presentation that she had bought her first house in Boston years ago thanks to the ACORN housing program, but with rising costs and gentrification had been forced out and now lived in a far suburb of the city. If you keeping hitting the wall, eventually it comes down, and tenants are rising now. It will be hard to stop us.